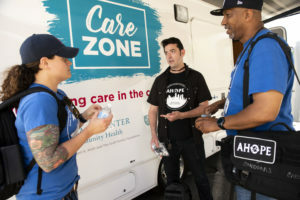 CareZONE is an innovative mobile health program that brings together partners in preventive care, addiction services, and harm reduction to serve individuals not well-connected to health care, experiencing homelessness and/or living with addiction. 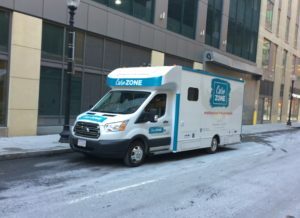 In its pilot phase, the van provides services in Dudley Square and the West End, communities with high numbers of fatal opioid overdoses. Using an innovative partnership model, CareZONE combats the opioid epidemic with accessible, on-demand care. 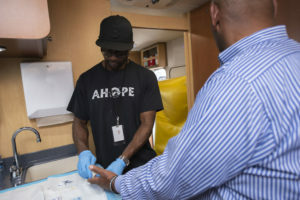 Experienced staff from Boston Health Care for the Homeless Program and the Boston Public Health Commission’s AHOPE program provide a range of services on the van and connect patients to community health centers, treatment programs, or specialty care. Preventive Care: Screenings, immunizations, chronic disease management (including hypertension, diabetes, HIV treatment), and referrals to behavioral health, hepatitis C treatment, specialty medical care, and other services based on patient needs and preferences. For this innovative program, The Kraft Center for Community Health at Massachusetts General Hospital is partnering with the GE Foundation, Ford Motor Company, the Hearst Foundation, Boston Health Care for the Homeless Program, and AHOPE, a program of the Boston Public Health Commission.